First of all, congratulations. 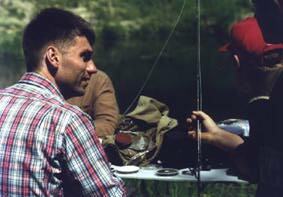 You are going to start with the wonderful sport of fly fishing, one of the finest in the world. You will discover the magic of a rising fish, the beauty of a sedge or a mayfly, and you will probably catch graylings or trout ... thats all you need to return happily home. Fly fishing is an Art, you have to learn the casting techniques, use various fishing methods and recognize the flies that live in our rivers. 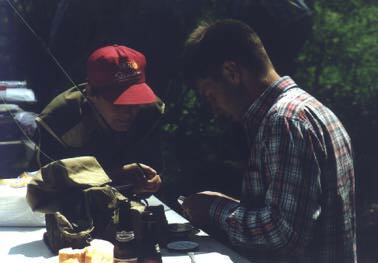 You might also learn how to bind a fly, and for sure, my friend, you will have become then a passionate fly fisherman. Fly fishing is perceived by many as highly technical and hard to learn. This is not completely true. The aim of this document is to provide some basic information to help you along. Those helpful hints are based on 10 years of passion and practice. You are free to follow them or not. Fly fishing is a space of liberty and happiness, and should remain like that. I like autodidacts. You can probably learn fly fishing on your own, reading books and magazines, and improving your casts during your fishing trips. Unfortunately, it will also probably take more time: you will not be ready the very day the fishes are rising, the trees will always be in your way, and you will quickly get such bad casting habits that it will be very difficult to get rid of them later on. Nothing can replace the advice from a fisherman friend. After a few lessons, you will have learnt the basics of the casting and the one thousand tricks so useful for your fishermans life. They are many fly fishing clubs in Belgium, France or elsewhere... Ask for information in you fly fishing shops. More details are available in the other articles of this site. Here I will just make a short description quite useful for what follows. This early season technique (March-April) can be used later around the year. Remember that fishes principally feed under the surface of the river, there are small fishes, fly larvas and all kind of underwater food. This technique requires big flies (mostly leaded) to imitate all this. Use a three flies leader and track the trout, find it behind the roots of a tree, below a river bank or hiding by a rock. In wet fly fishing, you do not see the fishes, you will try each good fish location and strike at any suspect movement of the leader or the fly line. The weather is getting warmer, the first hatchings appear. The fly larvas (or nymphs) that have grown up during several months progressively change, and one day they will break the surface of the river to fly a couple of days at the mercy of the winds and loves. It is during this final transformation and during the laying of eggs, that the flies are vulnerable to the trout appetite. The dry fly fisherman will imitate the flies with very light imitations, floating on the river. Nothing is more exciting that seeing a trout picking a fly, especially if it is yours. Another possibility is to see the fish... then no need for an indicator, look deeply in his eyes, if it opens his mouth and smiles, or if it moves away from its location in the direction of the nymph, you might guess that it catches your fly and then strike...This fishing technique requires of course an excellent view, clear waters and a calm attitude. Mostly used for graylings, chubs, and barbels...the trout being more shy, they are difficult to come up to. A réservoir is a large area of still water, a lake or a pond. You can practice with dry or wet fly (in this case, you will have to bring back the flies, because there is no stream) or with a streamer. Streamers are very big flies, colourful, they imitate small fishes and excite the trout. Like streamer fishing but with huge flies, a pike will not move for small food. What do I have to buy to catch fishes with the fly ? It is your first question, isnt it ? Have only what is necessary (I dislike carrying staff) but everything you need (I dislike much more to miss something when I need it). A boat bag (military service souvenir) with my waders or boots. A rod carrier (strong - PVC or aluminium tube) with my rods. A gear bag (with many pockets and compartments) to hold my fishing vest, my reels, a spare set of fishing clothes, a rain coat, various monofilaments, a small entomology book and maps where I go fishing. What is important is to have everything, ready and easily transportable. Have to prepare a minimum in the early morning, so you will not forget any vital component... what could be quite funny if you are fishing in a group and hopelessly sad if you are alone !!! Indispensable ! Your first fly rod will probably not be the last one. You will probably follow the advice of a friend or the fly shop manager. The price will influence your choice. They are nice carbon rods for a good price, do not spend too much money to start. It is better to keep it for the time you will really be able to choose what you want. They are fast rods with a top action, others are slower with a parabolic action and jewels in bamboo. I like fast rods that suit my adventure like fishing spirit, in small rivers where you must be able to cast behind the trees, if you are fishing larger streams with less obstacles, a parabolic rod could also be nice. A 9 feet rod for a 5 weight line is the standard for fishing virtually any place in the world, from small streams up to large rivers. Used to keep the fly line and it is all! Find one adapted to your budget. Only its weight must be adequate, it must compensate the rod weight, that means that the rod and the reel must balance around the upper position of the handle. If like me, you love beautiful objects, strong and durable, the Hardy reels are a good choice. There are also reels in composite material, light, useful and quite cheap. Be just careful with automatic reels that used to be too heavy. It is quite understandable that you are lost looking at all the variations in fly lines that you might find in a shop. You have to choose the weight of the fly line, its size and its shape. The floating lines (F) are especially suited for dry fishing or nymph, the sinking lines (S) are used for wet and streamer fishing, the intermediate lines (I) can be used for all techniques. Different shapes are available. The two sides of a Double Taper (DT) line can be used and allow a good presentation of the fly. Weight Forward Taper (WF) lines make possible long casts with no effort. Shooting Head (ST) lines can be used in réservoir, where you must cast long almost all the time. Except for isolated situations, a floating line should be the first choice for anyone starting in fly fishing. It is ideally suited for use with dry fly or streamer (near the surface), but can also be used with wet flies. The size of the fly line is usually indicated on the rod, it is better to use a heavier line for the beginning. Many other formulas are available, some with wisps of equal lengths, other with increasing lengths wisps... What is more important is to test your leader, take your time to find out the leader adequate to your rod, your fly line and your fishing style. If the weather is windy, a shorter leader will be more pleasant, for a beginner, I would advice a leader not too long, not more than 50 cm longer than the rod. If during your fishing, you damage the leader or if there is a knot in the leader, replace directly the spoiled wisp. The different wisps are linked together with knots. It is always at the knot, it will break... It is a delicate point. Test the knot after you have finished it. Some knots are really weak... What is better, that you break it or the trout ? Wet the knot when making. This special knot must be very discreet to avoid frightening the trout, go smoothly in the rod rings and allow you to change easily the leader. How to fulfil those different requirements ? The big diameter monofilament is directly connected on the fly line with a simple knot. I prefer this system because of its simplicity and discretion. There is no loop, the leader being the prolongation of the fly line. The only difficulty of this system is the strategy you will use to change the leader. Having no dedicated loop at the end of the fly line, each time you want to connect another leader, you have to make another knot with the monofilament connected to the fly line. You can have a couple of spare leaders starting all with 40 centièmes, that you will fix to the 50 centième permanently on the line. I personally keep the same leader all the year round, modifying occasionally the small diameters monofilament. Here a loop in monofilament is fixed at the end of the line. If you want to connect another leader, just finish this leader with a loop and pass one loop in the other. I find those two loops not so aesthetic and a little bit difficult to pass in the rod rings. It is also possible to find a kind of monofilament sock that is fixed on the line with glue. This system shows the same advantages and disadvantages than the preceding one, but also create a rigidity on the line. You will change many times your tippet during a fishing day. Take with you 3 or 4 tippet spools with small-size monofilament to replace the tip of the leader. If you like to observe the fishes in the water..
To preserve your teeth...also hung on a roller. To dry your flies, it can be replaced with a small piece of chamois leather. Personally, I take the trout in the hand (wet) and I assume they like that because they remain quiet and calm. In another hand, I try to release the graylings in the water, they are moving too much to be kept in the hand without any damage. Remember that graylings are very delicate fishes that need to be handle with respect. For a long time now, I do not take a landing net with me, I always get hooked with it. I will not forget the waders or boots. I would first buy boots, that is quite sufficient for almost all the rivers of Belgium. Waders are necessary if you are fishing big rivers where you need to be in the liquid element. Be objective. If you want to have a good cast, you need a professor. Like golf or tennis, it is primordial to have a good start and not to get into bad habits. What looks simple, will become simple with some practice (6 months for some people, 6 years for others). For some people, even after 30 years, they should better start all over again. However, the principle is quite simple. Take a big rope of 7 or 8 meters long, lay it straight behind you, take one side and with a decided movement of your arm, cast it in front of you. Yes it works, and the rope is almost straight in front of you. Try the same with the rope in packet behind you, do the same movement with your arm and you will see that you are not able to cast anything at all. This example explains the ABC of fly casting. Casting is ONLY possible when the fly line is straight behind you. Thats what we call the timing. This very important component of a cast will depend on the length of line you want to cast. The rod movements are faster when casting short, and become slower and slower with the length of the cast. I you have understood that, it is a good start. Now, lets talk about the rod movements. Compare the rod movements with the watch hands, the hour hand for the front movement, the minute hand for the back one. Without obstacle, the ideal cast starts at 10hours(front) and stops at 10min. (back). You can believe this is a quite small movement but actually it is more than enough to cast 15 meters of line. A more difficult situation would be cating with a slope just behind you. There the back movement must stop at 12h. and the fly line will go over the embankment. Never forget that the position of the rod determines the height of the line up the ground. If the position in behind 15min., you will be on the lawn or in the tree, if you go before 9h., you will touch the water and frighten the fishes 15 meters around. That are the two major principles, you will transgress them with the time. THE BEAUTY IS THE MOVEMENT. You are on this bridge facing a large river at dawn. You are looking at this fly fisherman that cast the line without any difficulty and lay down its fly like a roses petal. No one could resist such a spectacle, so, please be elegant. Try not to cast with your shoulder, it is ugly and not useful. Actually, it is acceptable only in two situations: if you are deep in the water and do not want to be wet or if you want to make long casts. The left hand only takes the fly line out of the reel or retrieves the line when needed. The elbow remains near the body, and does not move. A elbow moving all around, taking with it shoulder and hand is neither efficient nor elegant. A good cast depends on the forearms movements: not jerky, not flabby and certainly not brutal. Nowadays rods cast almost on their own, you just have to help them with a good balance between line and rod. I advice that you select a fly line a little bit heavier, so you will feel better the movement. Now, you know the basics. However nothing will replace the advises of a professor, who will correct those defaults that inevitably affect your style and are very difficult to get rid. Where to find the fishes ? Trout and graylings have different habits. The fishing technique and the locations of the fishes are different. From March to April, you fish the trout... Fishing grayling is prohibited, and if it is right it is easier to catch big graylings during this time of the year, I do not find it very fair-play to track spawning fishes. With high rivers, you are looking for trout in the borders and slow parts of the streams. With normal river levels, prospect the streams borders, the rock eddy, the pools... If you are dry fishing, the rising will guide you, of course. Look carefully the borders, just behind the trees. Nice trout often stay in a few inches of water. Later on, focus on graylings. They stay together in the streams, and the end of the pools... they are not always easy to catch. It is a nice early morning, the sun illuminates your river and the fishes begin to move. 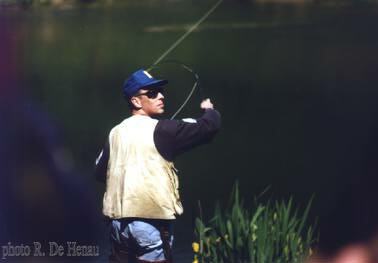 You fish dry and start with this nice trout in the centre of the pool, when two other fly fishermen just come up. They go along the river, and start fishing 20 meters upstream !!! They have broken the charm, even if you are tolerant and will capture a couple of graylings behind them... You would like to scream, why to fish here when the river is completely desert, why not start 200 or 300 meters upstream ??? Respect the other fishermen. Wet fly fishing usually means fishing downstream, and going down the stream. On another hand, dry and nymph fishermen will go up the river. If you are second, start with a spot where you will disturb a minimum other fishermen. Distance between fishermen depends also on the size of the river and the fish activity. When trout are rising all over, you can stay hours on a very small section of the river. Respect the fishes. Take only what you need for your own consumption. It is so nice to eat the fishes in good conditions, quickly after the capture... rather than leaving it in the freezer. A grayling keeps its taste only if eaten just (next meal) after the capture. I fish without ardillon. It is easier to release small (or big) fishes... Do not think you will loose many fishes, I can assure it. Respect the nature and the river. Do not litter, do not leave pieces of monofilament behind, it can be very dangerous for all kind of animals around. I you want to get rid of monofilament, cut it in small pieces... Try to get back any fly in a tree, it is not for the price of the fly, but for the birds and the bats that also love flies... I saved a small bird once and I was not so proud to be a fly fisherman, that day. !><))))'> Enjoy the wonderful world of fly fishing <'((((><!